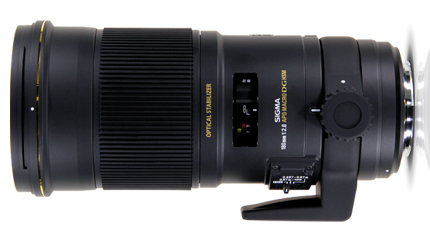 Sigma Corporation, a leading researcher, developer, manufacturer and service provider of some of the world's most impressive lines of lenses, cameras and flashes, has announced that the Sigma APO Macro 180mm f/2.8 EX DG OS HSM will be available in the United States on July 27 for the street price of $1,699. RONKONKOMA, NY July 13, 2012 – Sigma Corporation, a leading researcher, developer, manufacturer and service provider of some of the world's most impressive lines of lenses, cameras and flashes, has announced that the Sigma APO Macro 180mm F2.8 EX DG OS HSM will be available in the United States on July 27 for the street price of $1,699. The new APO Macro 180mm F2.8 EX DG OS HSM lens boasts Sigma’s proprietary Optical Stabilizer (OS) technology and a wide F2.8 aperture to allow faster shutter speeds for narrow depth of field. With the OS feature, the lens offers the use of shutter speeds approximately four stops slower than would otherwise be possible, enabling handheld, close-up photography. Three “F” Low Dispersion (FLD) glass elements, which have a performance equal to fluorite glass, are included to provide excellent correction for color aberrations, and an inner focusing system enables this lens to photograph objects precisely throughout the entire focusing range. Overall length does not change during focusing. Equipped with the Super Multi-Layer Coating feature, the APO Macro 180mm F2.8 EX DG OS HSM lens reduces flare and ghosting, and delivers sharp and high contrast images, even in backlit conditions. The incorporation of Sigma’s Hyper Sonic Motor (HSM) ensures quiet and high-speed autofocus, as well as full-time manual focus override capability. The macro lens has a rounded nine-blade diaphragm to create an attractive blur to the image’s out-of-focus areas. At 1:1 magnification, this lens has a focusing distance of 18.5 inches, which is a greater working distance than shorter focal length macro lenses, making it advantageous when taking pictures of highly sensitive subjects. It is also compatible with Sigma’s 1.4x EX DG APO and 2x EX DG APO Tele Converters. To locate an authorized Sigma dealer near you, visit http://www.sigmaphoto.com/where-to-buy-sigma. To use Sigma’s new Lens Finder Tool to find the best glass to suit your needs, visit http://www.sigmaphoto.com/sigma-lens-finder. For information about Sigma Corporation of America, visit www.sigmaphoto.com, or follow the company on Twitter and Facebook.